Don’t throw your description away completely – it’s still a valuable asset! 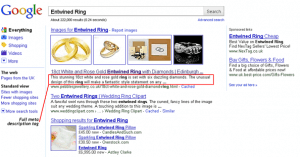 Way back in 2010 published the post below about the importance of the meta description tag in encouraging searchers to click-through to your site rather than another listing be it above or below. Today, 2 June 2017 Google has confirmed that it is important. They don’t say it that it impacts on rankings but that it is important as valuable information for searchers ‘encouraging them to click-through’ to your site. 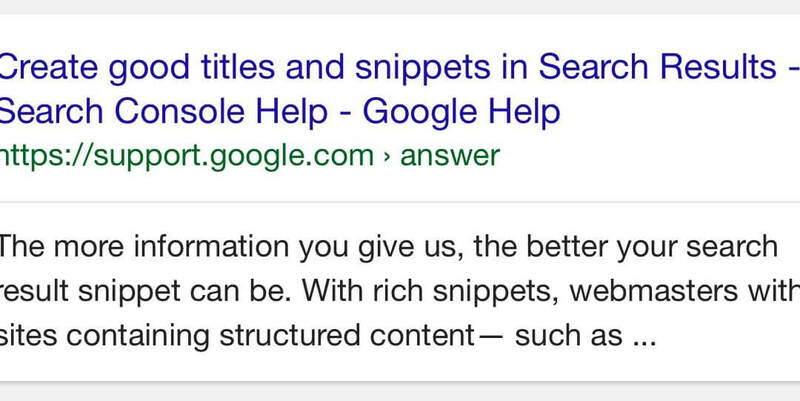 “Search result snippets are much the same; they help people decide whether or not it makes sense to invest the time reading the page the snippet belongs to. The content of the page is an obvious choice for result snippets, and the content that can be extracted is often the most relevant to people’s queries. However, there are times when the content itself isn’t the best source for a snippet. For instance, when someone searches for a publishing company for their book, the relevant homepages in the result set may contain only a few images describing the businesses and a logo, and maybe some links, none of which are particularly useful for a snippet. Although Google no longer uses the description tag, or ever did, the description tag still performs a valuable contribution in your SEO (search engine optimization) or more accurately, your SEM (search engine marketing) tactics. 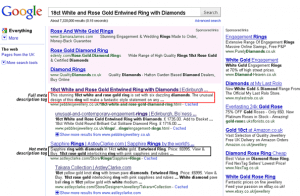 In October 2009, Matt Cutts, at that time the head of Google’s Webspam team, confirmed, in a Q&A session that Google does not use the keywords tag as a factor in their search algorithm. That was not really news as it has been known for a long time but he also confirmed that the description tag is also not a factor when ranking pages in search page results (serps). But, he also confirmed that when appropriate or relevant they will and do include content from the description tag below the page title in results pages. It’s important because if you have worked hard enough, through your SEO activities, to get a page 1 spot in Google there are 9 of your competitors also there trying to take YOUR potential and hard earned customer for themselves! So, having a good, relevant snippet displayed below your listed page title can make the difference between a clickthrough and a successful sale or losing that opportunity to a competitor who worked that little bit harder! It’s not by magic, the black arts, nor is it rocket science – it’s by writing a good and relevant description of the page content and using your pages targeted keywords constructively and appropriately in the copy. There is no need to stuff all the keywords you can think of as it will appear unreadable to the searcher and likely have the opposite affect to your desired one! 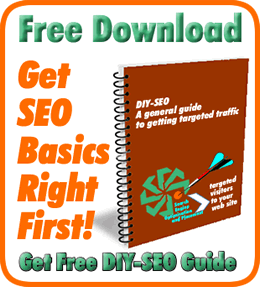 As Google disregards it for ranking purposes it primary and only function is to entice the viewer to click on your listed result. So it needs to be relevant and readable. As you would expect with such a long-tail search, the top result is their product page, but the important point is that the full 155 characters shown as a snippet below the title is taken from the entered description tag copy. It contains a good number of the entered search terms. 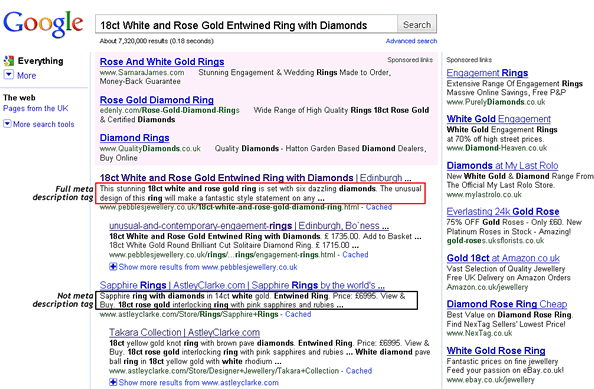 Google has deemed that it is the best relevant content to use as the full snippet. which would have been their preferred one! So, even in the above search with only a two-word search phrase, with only one of the search terms in the meta description, Google still considers the full entered meta description as the best text to show. It shows that its inclusion in the first search was not solely a result based on such a long-tail search term with more of the entered terms in the description! 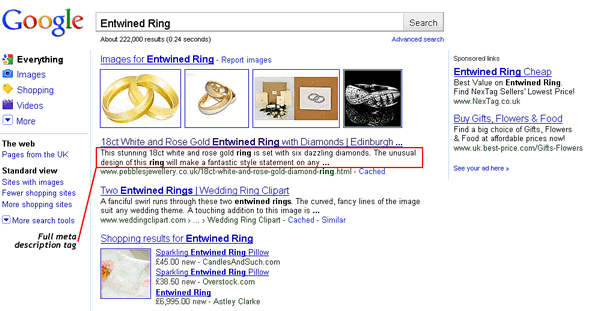 As confirmed by Matt Cutts above, Google will and does choose what it considers to be the best and relevant addition to its search results and indeed does use the meta description tag when it conforms to that criteria. Taken together, a clear and concise page title and your preferred page description, might just be the combination to get that all important first clickthrough! So, as the bottom line – Don’t throw out the description tag with the bathwater just yet!